There are some locations for landscape photographers that are virtually impossible to drive through without stopping to take a photograph. In my mind, Glencoe is one such location. It is stunningly beautiful and impressive no matter the weather. I still have many happy memories of my last visit. Check out this video of my last visit to Glencoe. A few weeks ago I was heading up to Harris & Lewis for a week-long photography trip. With such an amazing destination one could be forgiven for trying to get there as soon as possible. However, when your route takes you through the heart of Glencoe there was no way I wasn’t going to take at least one photograph. Fortunately for me, my journey from Devon would allow me to arrive in Glencoe for around sunset. With so many locations to pick from in Glencoe, what would I photograph? I first discovered the beauty of this location on a workshop I attended last year. Despite its grandeur, it’s not that well photographed and can be easily missed despite its roadside location. As I photographed it at dawn last time, I thought I would try it at dusk this time. I wasn’t feeling any pressure to take an image so I spent a little more time experimenting with my composition. While I would normally only post one image from a location, I thought it would be interesting to show you the three variations I have. Stob nan Cabar from Lochan na Fola (Vertical), Glencoe, Scotland - Nikon D850, Nikkor 16-35 mm f/4 at 16 mm, 0.8 seconds at ISO 64, f/13, Lee Filters Circular Polariser, ND Grad. Stob nan Cabar from Lochan na Fola (Landscape), Glencoe, Scotland - Nikon D850, Nikkor 16-35 mm f/4 at 18 mm, 1.0 seconds at ISO 64, f/13, Lee Filters Circular Polariser, ND Grad. Stob nan Cabar from Lochan na Fola (Panoramic), Glencoe, Scotland - Nikon D850, Nikkor 16-35 mm f/4 at 16 mm, 0.8 seconds at ISO 64, f/13, Lee Filters Circular Polariser. 8 Image panoramic stitch, cropped to 6:17. All three images benefit from the beautiful autumnal colours of the ground, and just the right amount of cloud cover to get some light reflected from the setting sun. While I do like all three, I think it is perhaps the first image I prefer the most. Though this scene would typically be shot in landscape orientation, the portrait orientation of the first image works well. There are a couple of things I like about the first image. First of all the reflection is larger, and clearer giving it more impact. I also like all the triangles in the image. There is, of course, the mountain and its reflection, but also from the cloud in the top right of the image which leads you back to the mountain. It was a long drive from Devon to get to Glencoe so I only had time to shoot this one location, but what a location. It was unfortunately dark when I drove back through Glencoe, but even this brief opportunity to photograph it again means its right up near the top of my list of locations to photograph again. So which image composition did you like best? 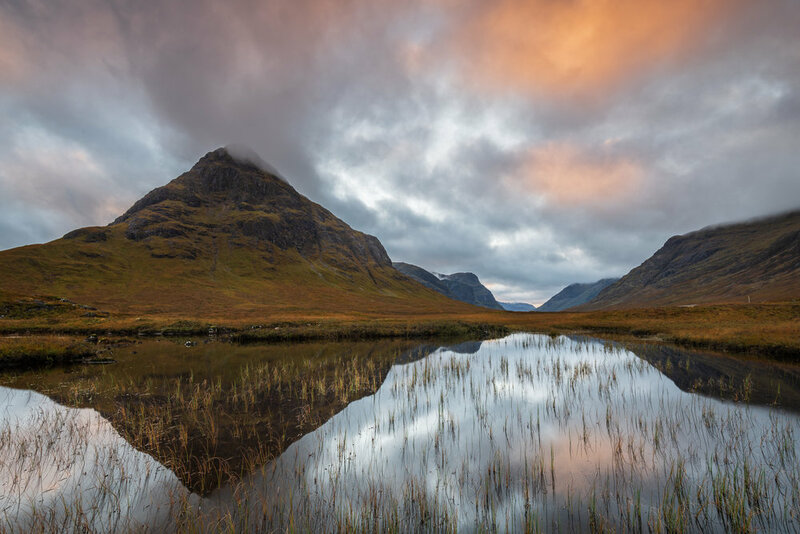 What is your favourite Glencoe location to photograph? Let me know in the comments below. Oh, that Harris & Lewis trip I mentioned at the start of this blog…well…I hope to have a blog and video posted right here in a couple of weeks time.